In short - No lights on the CBF 125 will typically indicate a problem with the stator which is part of the alternator. Also consider the regulator rectifier. With no sign of anything amiss I rode the bike to work that morning. When I came back to the bike in the evening I started it up and I noticed a strange noise immediately. It is a hard noise to describe, the best I can do is to is image a man making that spooky ghostly "ooooooooo" noise but monotone. The pitch rises and falls with the revs and is quiet, background to the everyday engine noises. Then I noticed the lights were not working. I considered the starter motor was stuck. I considered the flywheel was loose on the crank. I considered a failing bearing. I negated the starter motor by removing the whole starter mechanism but the lights did not light and the noise remained. The flywheel was secure on the crank, it must be as the flywheel also feeds the crank position sensor without which the engine would not start. I knew because of the lights the problem was at least in part electrical which pointed to the alternator. By removing the stator from the system I started the bike and the noise had gone. It HAD to be something to do with the stator. While all the electrical tests showed no problems the lack of lights and the noise from the stator meant it HAD to be the stator. I was sure. Sort of. Sure enough to spend £116 for a new stator from Honda. And while I was at it I also got a new regulator rectifier as the pair work hand-in-hand and if one breaks it often breaks the other. I fitted these items and the bike works fine now, it feels great. An alternator creates electricity by passing magnets around coils. 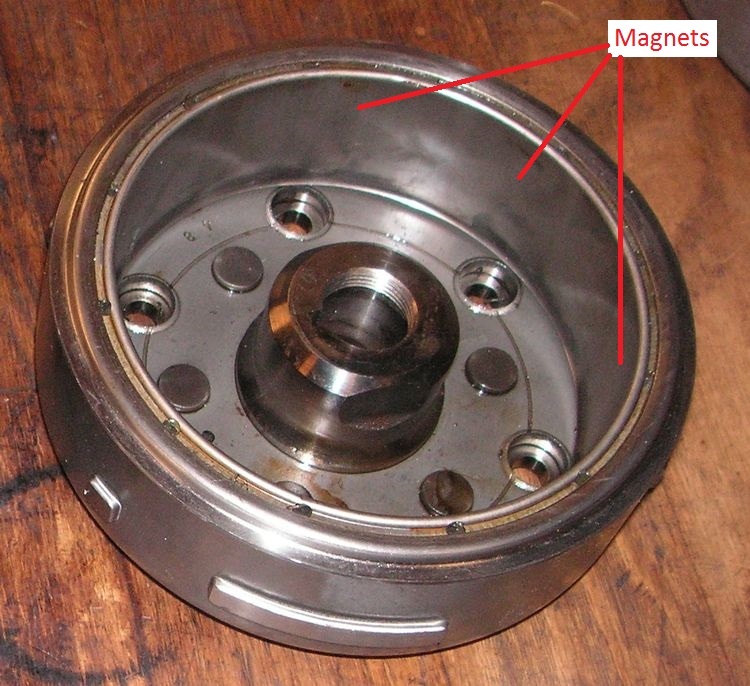 In the case of most motorcycles the magnets are attached to the end of the crank in a "bowl", known as the alternator rotor. The coils are fixed to the engine case, they stay still, but sit inside the spinning "bowl". An alternator rotor. The magnets actually run all the way around the inner face of the "bowl"
The stator. This sits inside the spinning rotor and stays still. So the magnets are spinning around the wires that are wound up into coils on the stator. Due to some weird electromagnet stuff when magnets pass coils of wire electricity is "induced" into the coils. This electricity is used to charge the battery, light the lights and power anything like fuel pumps and engine control units which are actually small computers. The alternator makes electricity. Unfortunately not quite the sort of electricity your motorcycle needs. Firstly when the motor is running slowly it makes a bit of electricity. When the motor is revved up it makes a lot of electricity. To run your lights, computer, fuel pump and digital clocks it might take 150 watts. At tickover the alternator might only make 100 watts so the battery has to provide the rest. But at 8,000 revs it might make 300 watts and that's too much! The regulator esentially "dumps" the excess power as heat. The electricity from the alternator is AC, alternating current. It's far too complex to explain on this simple page the whys and wherefores but your bike uses DC, direct current. The job of the rectifier is to convert the AC from the alternator into DC that the battery and the rest of the components use. This is a VERY simple explanation of the regulator rectifier. It's actually a simple device doing a very complex task. If you need more details you'll find them online. A typical "Reggy Reccy". Notice the fins to cool it when it "dumps" the spare electricity. Why did I replace both the regulator rectifier AND the stator? Because I'm not an electrical genius that's why. If the stator breaks due to a broken wire or a short, the reggy reccy might receive far too much electricity and get fried. 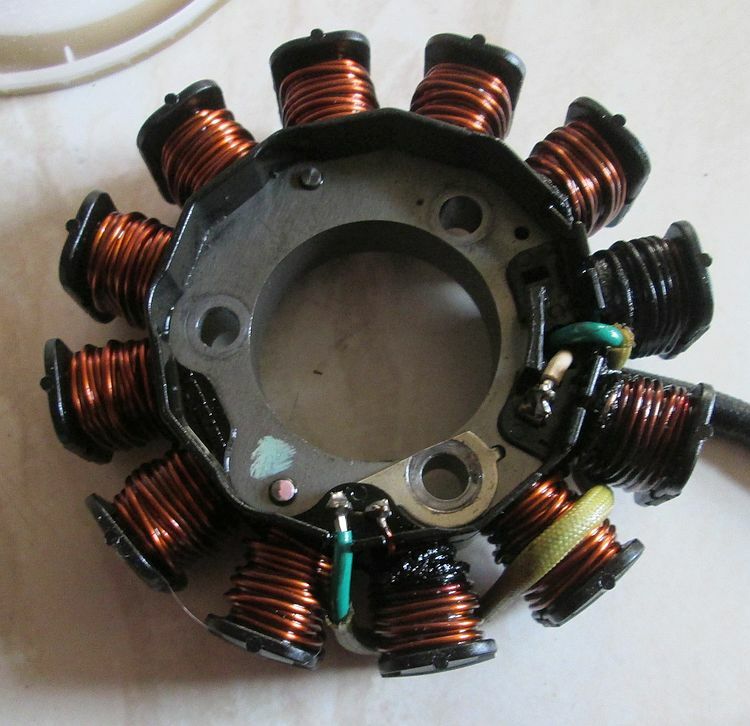 If the reggy reccy breaks it might ask the stator for too much electricity and overheat the coils. I'm making guesses here but what I do know is that when one breaks it can cause the other one to break as well. Far smarter people than me with clever equipment will know exactly how the alternator and the reggy reccy work. They may also have the equipment to test each item, find the exact fault and make sure everything else is working. I however don't have access to that knowledge or equipment. I didn't want to spend £116 on a new stator only for the old reggy reccy to burn it out in a few weeks. hi there, just had the very same problem with my bike. not replaced the stator yet, but the new regulator is in there, i just like you said. 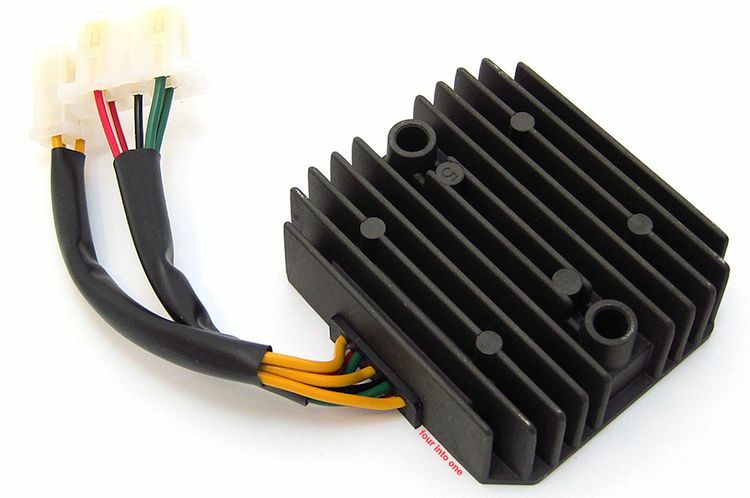 im no genius, and its better i started at the cheaper part and then go to more expensive part (the stator) becuase its worth replacing both parts. Hi Harry. I hope you get it sorted out. I've seen quite a few posts on forums and across the internet similar to mine so it seems a common issue. My side,head,main and tail light stopped working and took out the alternator and it had 3 points which had burnt out could this be the reason the main lights won't work. Hi Rocky. It sounds to me that the alternator is your issue. It's also worth checking your regulator rectifier too and the wiring. I do not have a specific method of being 100% sure it is the alternator, you'll need the help of a professional for that. Thing is they're not too cheap so it's certainly worth exploring all angles before you make your purchase. Today morning I tried to turn the bike on and it was dying all the time. I pushed it down the road, putted on second gear and finally managed to turn it on. Then I've heard a lot of explosions coming off my custom exhaust; at first I kinda liked it, but soon the bike died again, leaving me walking all the way back home. Changed the battery and spark plugs, didn't make a difference. Then a friend told me it should be the alternator. Unfortunately he was right. The coils were all burned. Do any of you know why they got burned? Hi Ben. Welcome to the world of the dark arts. If you look on any forum regarding this subject there are as many opinions as there are people. Some say "too much load" others "old engine oil" others "failing battery" others "excessive heat" others "crap build quality" others "general wear and tear" others "failing regulator/rectifier" and so on and so on. So no, I don't know why your coils burned but I do know mine have burned out twice so far, once at around 30,000 and again at around 59,000. If you manage to find the everlasting coil please be kind enough to share them with us! That's a new one on me Kieran. My alternator made a spooky "oooooo" noise, quite quiet. That said I didn't get chance to ride it at pace. I don't have an answer for you. As a matter of safety though check your tyres, wheels, chain and sprockets. +1 Ed, are you sure this is rpm related and not road spedd related. If road speed you need to be looking elsewhere. Perhaps post more details. Can it be replicated in other gears. Can it be replicated at standstill. Is the chain correctly adjusted and lubed. Yeah we'd need more details. I am tempted to suspect the alternator but there's quite a few other more important safety items I'd go through first.